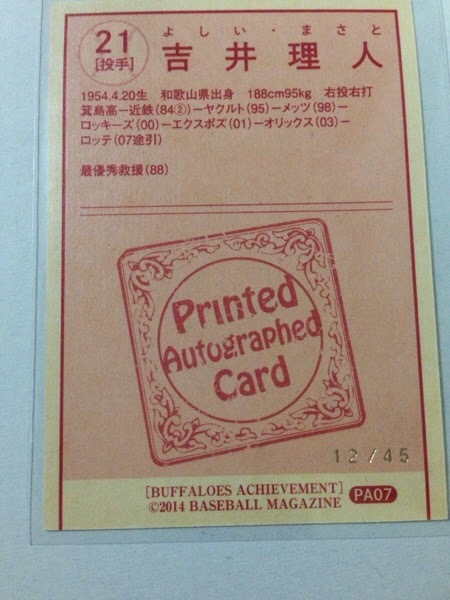 The last BBM Achievement set to be released features the Kintetsu Buffaloes of 1979, 1980, and 1989. These were years the Buffaloes were league champions. 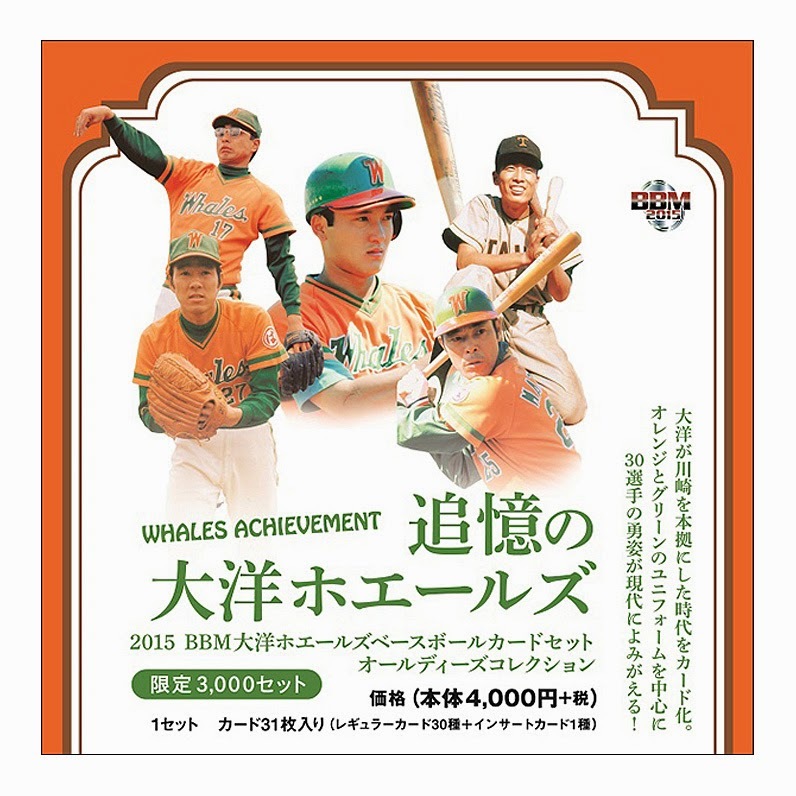 As with the other sets (Whales, Braves, and Hawks), the design is reminiscent of menko cards from the 1950s and 1960s. The Buffaloes design uses red for the front photo border and on the backs. There are 30 cards in the set. 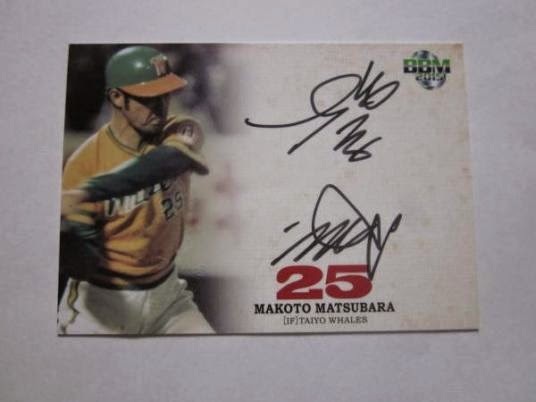 Again, Printed Autographed Card partial parallels were included with quantities of 45-50 each. There are 22 cards in the set, uniquely numbered from the base set. And autographs are again the main draw here, with 21 subjects inserted. One player has 35 copies, another has 62, and the remaining have up to 100 copies each. And like the Whales set, it's a bit difficult to find images; there aren't many of these posted out there. These are on-card signatures. Like most other BBM box sets, 3000 sets were issued. One autographed or foil autograph card was found in each box. Suggested retail price is 4000 yen. BBM seems to have wrapped up its Achievement series, at least for the time being, after issuing two sets in December labeled as "2015" issues. One of those two features the Whales. The cards use the same design as the Buffaloes, Braves and Hawks sets, with different border and card back colors. The images look grainy, similar to the effect Topps uses with Heritage. There are 30 cards in the set. There is a foil-signed partial parallel, Printed Autographs. There are 22 cards in that set, each serial numbered to 48 or 50 copies. Additionally, 20 players signed autographs; one has 50 copies but print runs on the other cards are near or at 100 copies each. These are all on-card signatures. 3000 sets were produced and sold in boxed form with one printed autograph or hard-signed autograph per box. Retail price was 4000 yen, but it seems like the Whales set hasn't sold well, and I've seen a couple around 2000 yen on Yahoo! Japan Auctions in the past couple weeks. Singles haven't appeared frequently on the auction site either. You know the saying. Good things come in small packages. That's certainly true for many things, though I'm not sure Steve's package could be called "small" - it was a 200-count box packed with great cards. 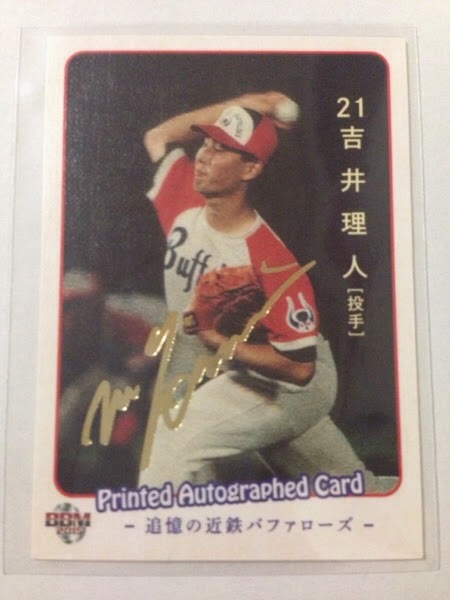 Okay, maybe he could have forked over a small fortune to send me a monster box filled with 1993 Finest Refractors, or sent over a shipping container overflowing with low-numbered parallels. But on the other hand, one or two cards is small. And I digress. There was quite a large number of cards in the box, all of them great, but I was most happy to see the smaller-sized cards. The throwback minis Topps inserted into its packs over the past few years have slowly grown on me, and I've been gradually building the sets, picking up cards here and there whenever I can get them at a reasonable price. But the 1989s from 2014 (does that make sense to anyone?) have been fairly elusive. Steve found a mass of them, though. The 1989s might be my favorite of the throwback minis. 1989 was the year I started collecting, so the relatively simple design has a lot of nostalgia. This is also the only year that were die-cut. That gives them just a tiny edge over the others. One thing I've noticed about these minis is that the photos are very similar in style to the original 1989s. Lots of not-quite action shots to avoid blur, and plenty of posed shots. As far as action shots go, those three show about the least amount of action you can get from the field. How cool would it have been if Topps had called him Rock Raines again? "Pudge" Rodriguez doesn't look so pudgy there. Compare "Pudge" to Prince. Then you'll see what I mean. I think the cards from this point on are from Update. Or at least Series 2. Topps used a whole bunch of Spring Training shots later on in the set. That screams 1980s Topps. Double Bryce. Twice as nice? Nothing says multi-million dollar MLB player like a chain link fence and a bush. I bet some of these pictures were taken specifically for sets like Heritage, Archives, and this set in mind. Were all the Yankees active player photos taken at Yankee Stadium in posed shots? Joey Votto's picture looks like it was taken late in the afternoon. That's pretty cool, if you ask me. The only thing these cards are missing are cars parked in the background. When Troy grows up, he wants to be 6'7"! Another active Yankee, another empty stadium. The Return of the Top 10 Want List!